This Chicago man says he's been coming to Wisconsin for 15 years to fish for sturgeon -- and this 63-inch prize is his first keeper. Conservation Wardens Tyler Strelow and David Youngquist of the South Central Region say they met the proud sportsman on Labor Day during the opening weekend of sturgeon season. The fisherman was about a half-mile upstream of the Highway 60 bridge on the Dane County side of the Wisconsin River, downstream of the Prairie du Sac dam. 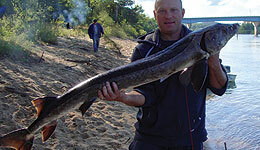 The 2011 hook and line season for sturgeon season opened Sept. 3 on about a dozen waters statewide and gave anglers the chance to reel in one of Wisconsin's largest and oldest fish. Lake sturgeon can grow to more than 200 pounds and live more than 100 years. The 2011 season marks the fifth year that the minimum length for harvesting sturgeon is set at 60 inches, with a one-fish limit per season. The season runs through Sept. 30, 2011.